This season keeps getting better and better! I was already gagging for this episode, because HELLO! Blondie! Also I can't get enough of Lucian, especially now that he's gone full on salt and pepper librarian dad. The episode felt super short, right? I could have watched Lucian and Chris Stein read those queens all day. Chris Stein calling out Chi Chi for wearing the same shoes in the challenge and on the runway makes him my MVP of the week, plus, like... everything Lucian said to Derrick in the rehearsal was hilarious, recapped in gif form thanks to Out's amazing gif-cap of the episode. Give it up for Robbie Turner, who knew there was a punk rock queen hiding under all that 40's housewife? Les Chicken Wing, please reform post-Drag Race and tour, k? 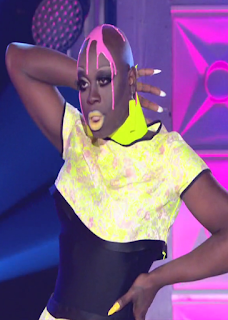 This week on the runway, the queens served neon fantasy, and just about all of them delivered. Acid Betty was at her grotesque best, Derrick Barry's geometric colour blocked swimsuit was the summer beachwear of my dreams, and Thorgy Thor turned 60's mod into disco daywear. 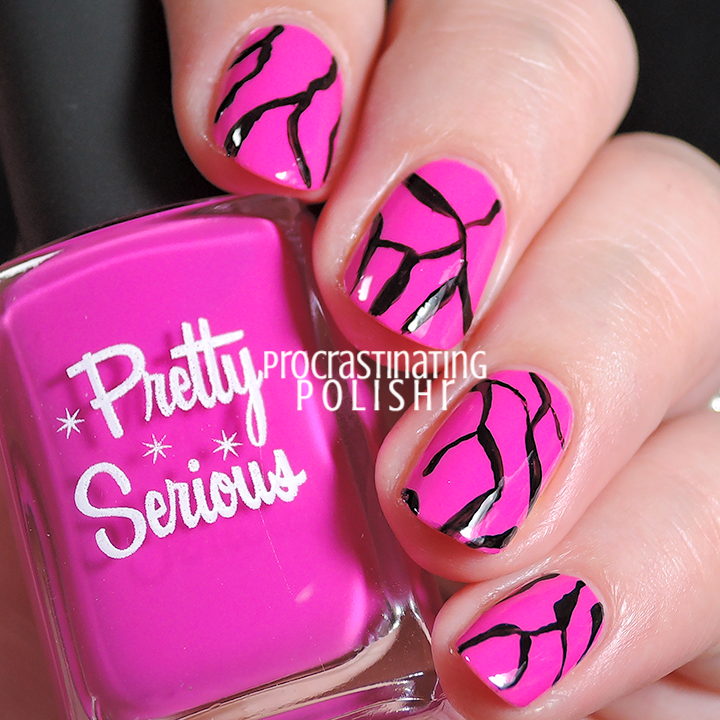 The most nail-artable of the bunch though... well take a peek! Yes, Bob again! Bob's runway this week was head to toe sickening. The colour clash of pastel and neon yellow, the tight black spandex midriff, the yellow lips, that pink splatter... DAMN! I was obsessed with the contrast of the pastel and neon yellow and had to get some drippy neon pink in there too. Of course, being neon, my camera had a meltdown and couldn't capture the pink to save itself but I am loving how those pops of yellow neon look! Chi Chi is one of the fiercest queens this year - even though she doesn't come out on top with the judges I am living for her every. single. week. Going into the LSFYL this week I was nervous for her but she turned it out acrobatic style! Even though the judges hated her runway, I was gagging for her neon Rihanna look. Yes, she needed that waist cinched but that face more than made up for it! Sweet, beautiful Naysha. You just don't have what it takes I'm afraid. You're gorgeous and sweet, and the reptilian neon fantasy was absolutely sickening, but you just seem to be lacking some kind of spark. Honestly, how could I not do nail art inspired by this blindingly fabulous bodysuit? After catching a glimpse of this on Whatcha Packin', I'm glad we got to see it in its full splendour! For me, Robbie Turner was a real surprise winner! I'd love to see more of this side of Robbie. Other than that it was hard to get a feel for anyone this week - so much time was spent on Lucian sassing the girls and the teams trying to psych each other out that I spent more time cringing than gagging.